Robert H. Mohlenbrock @ USDA-NRCS PLANTS Database / USDA SCS. 1991. Southern wetland flora: Field office guide to plant species. South National Technical Center, Fort Worth, TX. Yellow Jessamine (yellow jasmin) Gelsemium sempervirensis a high-climbing, woody vine. Yellow Jessamine has fragrant yellow clusters of flowers that bloom from December till March. 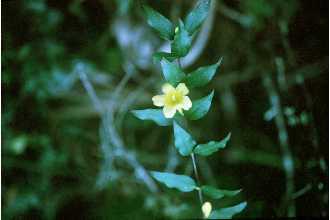 Yellow jessamine is a native plant of the southeastern United States. Yellow Jessamine is often used for landscapeing. The leaves are simple, opposite and lanceolate with a dark green surface. They are generally 1 to 2 inches long and about 1/2 an inch wide, with a long tapered tip. All parts of this plant are extremely poisonous to livestock but deer browse on it readily.